Here’s a review of every known bear species that lived during the Pleistocene in southeastern North America. Photo from google images of a black bear in the Okefenokee Swamp. Ursus abstruscus is the probable evolutionary ancestor of American and Asian black bears which once consisted of a geographically continuous population. Glacial ice separated the two populations at the beginning of the Pleistocene, resulting in two different species. Bjorn Kurten notes that Pleistocene black bears grew as large as modern day grizzlies. I believe Pleistocene black bears were larger and fiercer than their modern day descendents because they had to survive confrontations with saber-tooths, giant panthers, jaguars, and packs of dire wolves. Cavers and scientists discovered black bear fossils at Ladds and Kingston Saltpeter Cave in Bartow County, and the Isle of Hope Site in Chatham County. They’re also commonly found in Florida fossil sites but only a few have been recorded from South Carolina. Photo of a spectacled bear, Tremarctos ornatus, from google images. This is the only living species from the once widespread short-faced bear family. It is a close relative of the extinct Tremarctos floridanus. Of course, scientists have no way of knowing whether Tremarctos floridanus was also spectacled, but they call it that anyway. Now extinct, this was likely the second most common species of bear in southeastern North America during the Pleistocene. Only 1 specimen has ever been recovered in Georgia (at Ladds), but its fossils have commonly been found in Florida and South Carolina. It’s thought of as primarily a vegetarian, but a recent study of Pleistocene bears concluded that all were opportunistic omnivores that would eat anything they could obtain. Tremarctos’s range in the late Wisconsinian Ice Age seems to have been restricted to the southeast. During warm interglacials it expanded as far north as Kentucky. It probably just lived in the coastal plain of Georgia and South Carolina as well as Florida during colder climatic stages. Photo of a fossil jaw bone of Arctodus pristinus from Additions to the Pleistocene Mammal Fossils of South Carolina, North Carolina, and Georgia by Albert Sanders. 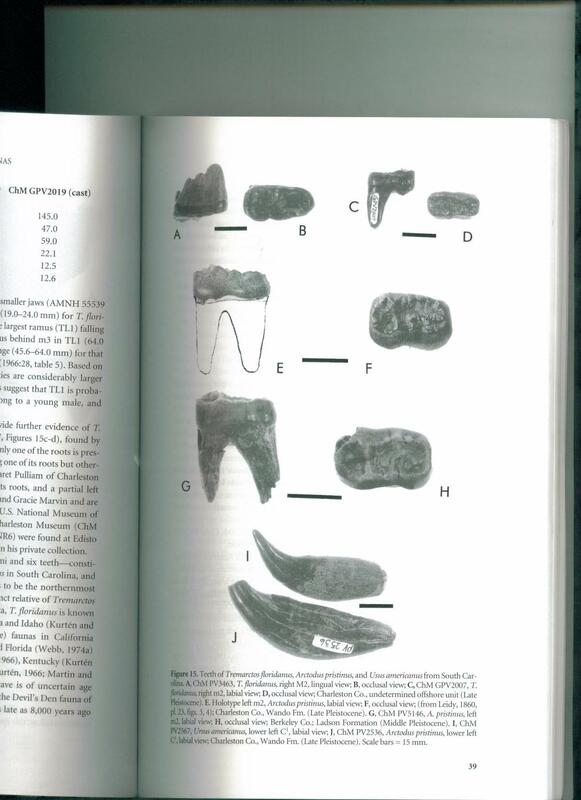 Photo of fossil bear teeth from the above mentioned publication. It’s unclear from the fossil record whether this species co-existed with its larger cousin, the giant short-faced bear, or was simply ancestral to it. Its fossils have only been recovered from a few eastern sites in Florida, South Carolina, Maryland, and West Virginia. Teeth attributed to this species overlap in size with those of Arctodus simus. Florida fossils of this species, including those from Leisey Shell Pit, indicate this animal lived from the early to mid-Pleistocene (~1.8 million-300,000 BP), whereas giant short-faced bear fossils in Florida date to the late Pleistocene (~300,000-~11,000 BP). However, fossils of the lesser short-faced bear were found in South Carolina sediments thought to date from the Sangamonian Interglacial (~132,000-~118,000 BP) which is also considered late Pleistocene. These South Carolina specimens haven’t been radiometrically dated, so no one knows exactly how old they are. Perhaps this species did survive as a relic species in some geographical locations until the megafauna extinction. Arctodus pristinus is considered more of a general feeder; Tremarctos floridanus a more herbivorous species; Arctodus simus a more carnivorous bear. 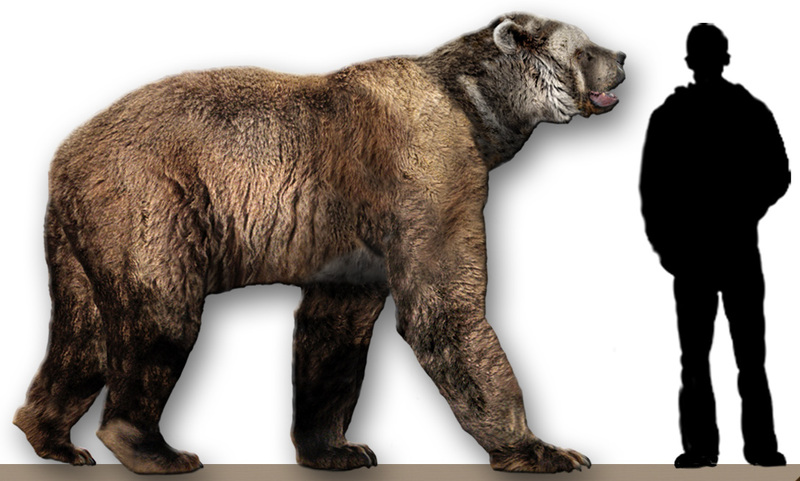 Dan Reed’s photo-shopped reconstruction of a giant short-faced bear. The giant short-faced bear ranks up there with mammoths, mastodons, ground sloths, and saber-tooths as among one of the most spectacular creatures of this era. Studies suggest it lived by aggressive scavenging. It’s extremely acute sense of smell detected blood from a great distance. Then, the beast would relentlessly trot toward the source of the appetizing odor, and its sheer size would intimidate the partially satiated carnivore that actually made the kill into surrendering the carcass. Arctodus simus fossils are more common in western fossil sites, but a few have been discovered in the southeast, proving it did occur here, at least sporadically. An Arctodus simus skeleton rested in the Fern Cave system in Jackson County, Alabama which borders northwestern Georgia, until it was discovered by cavers in 1970. 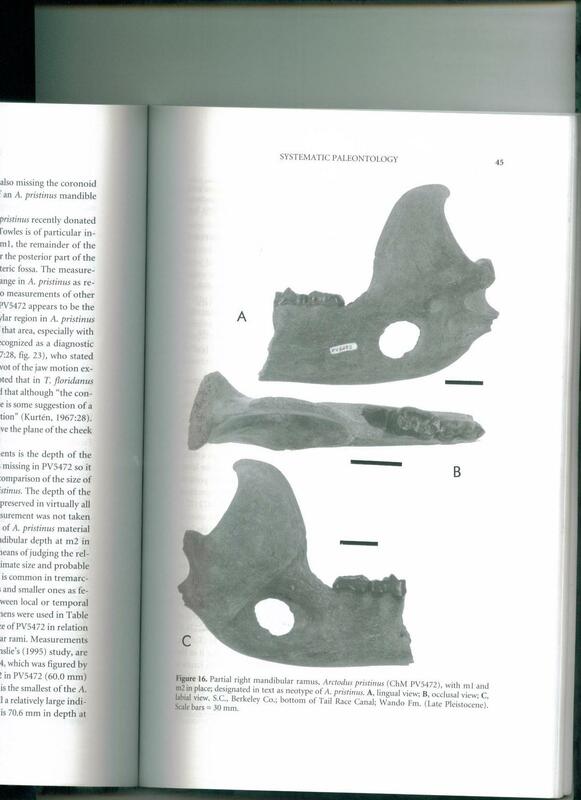 In addition a number of teeth from this species have recently been discovered in north Florida fossil sites, and some Arctodus simus material was also discovered in Virginia. Photo of a grizzly bear and cub from google images. Welsh cave in Kentucky yields grizzly bear fossils dating to about 12,000 BP. This is the easternmost known occurrence of this species. Grizzly bears roam hundreds of miles, so it’s likely if they lived in Kentucky then that they must have entered Tennessee. But the lack of grizzly bear fossils in other southeastern states suggests they never penentrated the region in significant numbers. Still, I believe a few irregular stragglers may have wandered into what’s now north Georgia. It may be that the existence of 3 or 4 other species of bears prevented grizzly bears from colonizing much of the southeast during the Pleistocene, and then man arrived, creating another obstacle blocking their migration into the region. Grizzly bears are a relatively recent addition to North America’s mammalian fauna, but they did live on the continent prior to the LGM, 30,000 years BP. They’re the same species as the Eurasian and Alaskan brown bears. If I could live in the Pleistocene (part 4). For those unfamiliar with this blog, I occasionally fantasize living during the Pleistocene but with modern conveniences, such as an adobe house with woodstoves, solar heating, electricity, and a time tunnel that connects me to the modern world. I’ve thought of a simple way to observe bears from my abode. Connected to my Pleistocene house is a 5 story watchtower designed in the shape of a lighthouse in which I can view the surrounding landscape. I would take a barbecue grill to the fifth story which has a canopy but an open window stretching for 360 degrees around. There, I would grill meats. The aroma should attract bears and other carnivores from miles around. A bear could potentially climb up the side of a light-housed shaped building, so I would have to have some kind of designed guards that would prevent this. I would avoid hunting bears, if possible. I think modern hunters who kill bears are jerks. I can understand why the pioneers did it. They didn’t have grocery stores and had to eat and make use of what they could obtain. But there is no reason to hunt bears today, unless they prove a danger to tourists. They don’t reproduce as rapidly as deer, and it’s just not ecologically necessary to hunt them. Bears were a valuable source of meat and fat for early settlers. Early accounts reveal an important dish of the Indians. The Indians frequently diced up venison (which is very lean) and fried it in bear fat. Bear fat was also the number one source of cooking fat in New Orleans in 1800. It was gradually replaced by lard as the settlers brought in hogs. This entry was posted on March 10, 2011 at 2:35 pm and is filed under Pleistocene Mammals, Uncategorized. You can follow any responses to this entry through the RSS 2.0 feed. You can leave a response, or trackback from your own site.